Landscapes have always been an uncontested topic of interest for the arts. They evoke our relationship with the very paradigm of existence – the awareness of impermanence combined with the driving force of live, which is the illusion of eternity. From German romanticism to land art, this portion of nature is the one see in the distance or are faced with up close, in its full weight, shape and force, as beings. The landscape always claims the sensitive experience; it sweeps us off our feet in the face of its quiet eloquence. Neither a romantic nor a utopian, Marina Camargo travels to the foot of the German Alps, one of the most iconic landscapes in Art History, and presses hard on the lowest note in a Wagner piece. The series of photographs, postcards and videos in her “Distant Reflection” exhibition continuously vibrates between the typical visual portrayal associated with the media and subject matter and the gloomy shadows of history; between the rugged landscape and the non-subtlety of iron plates or black paint, permanently etched onto photographs and film. 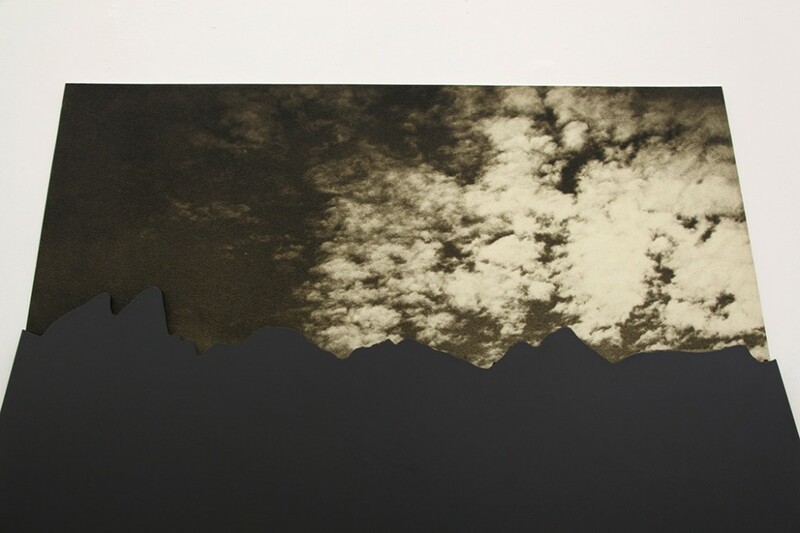 In Oblivion, a set of approximately 300 postcards of this landscape (purchased in second-hand bookstores), the artist meticulously buried the mountains using black paint. In erasing the image by adding something, Marina makes the shape of the mountains into something concrete, while, on the other hand, defines they are now to be forgotten once again – this time irreversibly. Under the paint, the landscape becomes a stain and, as such, suggests infinite associations with the stains of history – particularly German history. The stains speak also to the leads of memory that will not allow us forget even the things we dispose of. In the piece that lends its title to the show, heavy plates of iron appear leaning against seven photographs from an old book. In opposition to the delicate, handmade scale of the postcard set, the huge black plates extend all the way from the floor to obscure the drawing of the mountains – only the sky is visible, in the image. The air between the photographs and the plates seems to be impregnated by the iron’s weight, creating a dense atmosphere, which echoes across the exhibition. It is as if this very air could cause constant oscillation in another piece, the Alpenprojekt video, which hangs from nylon threads. The procedure of erasing by addition is repeated in other pieces, as is the case of the video The Mountains of Eva Braun. In these video records, originally filmed by Eva Braun while with her lover Hitler in their leisurely time by the Alps, Marina painted every mountain again, frame by frame. By creating a new film, one of dark landscapes – more befitting of its characters –, the artist reaffirms her stand regarding the iconic landscape. Neither a romantic, nor a utopian, she recognizes its beauty and the fullness of its tragedy. Originally published in Dasartes magazine, at the occasion of Marina Camargo’s solo exhibition “Distant Reflection”, at Bolsa de Arte gallery – Porto Alegre, Brazil.